"Hush puppies are a good side for seafood." In a medium bowl, mix together eggs, sugar, and onion. Blend in flour and cornmeal. Heat 2 inches of oil to 365 degrees F (185 degrees C). Drop batter by rounded teaspoonfuls in hot oil, and fry until golden brown. Cook in small batches to maintain oil temperature. Drain briefly on paper towels. Serve hot. 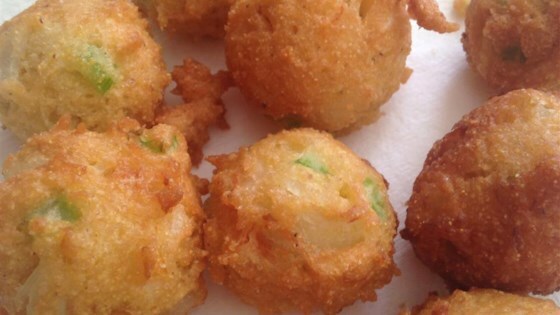 See how to make traditional Southern-style hush puppies. Excellent! I found that it was nessesary to add a 1/4 cup of milk to the mixture, as others had suggested. My husband said this one is a keeper!